Many visitors to Sri Lanka, who utilize cars and drivers, will often bypass Colombo altogether and start their tours from Negombo. But for travelers who opt to see the country by train or bus; the Fort area is the gateway and starting point for true independent travel. The Fort railway station is the country’s major hub from where all of Sri Lanka’s rail lines can be accessed. Across the road from the railway station, in Pettah, are several of Colombo’s sprawling bus terminals. The city is rich in history and has a number of interesting sites to visit. We believe that it is worth spending a day or two in Colombo before catching a train or bus to explore other parts of the island. Sri Lanka’s seaside city of Colombo is home to a culturally diverse mix of over 753,000 people. Traders have been sailing into the city’s large natural harbor for over 2000 years. Portuguese explorers first visited the island’s port city in 1505. Soon after arriving Portuguese traders made an agreement with King Parakramabahu VIII, in which they would have a monopoly on the cinnamon trade in exchange for military protection. In 1517 the Portuguese began building a fort to protect their growing business interests. By 1593 the Portuguese controlled the entire coastline but their dominance over the land would last less than 45 years. The Dutch signed a treaty with the King of Kandy in 1638 in which they offered military assistance against the Portuguese in exchange for a trade monopoly. After a long siege the Colombo fort fell to the Dutch in 1656. Following the victory over the Portuguese the Dutch East India Company controlled much of the island until 1796. The British started their occupation of coastal Sri Lanka during the Napoleonic wars in 1796. In 1802 the Dutch ceded their colony to the British and by 1815 they controlled the entire island which they called Ceylon. The British ruled Ceylon until it was granted independence in 1948. The location of this former colonial era citadel is now known as Fort and is the city’s financial district and tourism center. The best hotels and restaurants can be found here along with shopping at the Dutch Hospital Shopping Complex. It is well worth taking some time to stroll around this area where many colonial era buildings can be seen. These buildings showcase a number of different Dutch and British architectural designs built over the long period of colonial rule. Some of the area’s most famous sites include the Presidential Palace, Chatham Street Clock Tower and Cargills Department Store. Just to the east of Fort is the bustling area known as Pettah. Among other things Pettah is a busy shopping area where many different types of products can be found. The streets are crowded, dusty and hot, but it is an interesting area to walk around and watch the locals go about their daily business. In the center of Pettah, on Prince Street, is the Dutch Museum. Built in the 17th century by former Dutch Governor Thomas Van Rhee, as his official residence, it is a good example of Dutch Colonial Architecture. During the period of British rule the building was used for many different purposes including an armory, army hospital and post office. In 1977 it was opened as a national museum. The museum contains many pieces of furniture and artifacts from the Dutch period. Unfortunately, both the building and the items on display are in a very poor condition. Some people will undoubtedly find the museum a bit disappointing. Some other museums to consider visiting include the Colombo National Museum and the Economic History Museum. One of our favorite religious monuments is the Kelaniya Raja Maha Vihara. This Buddhist temple is located approximately 10 miles (16 km) from Fort in an area known as Kelaniya. To Sri Lankan devotees this is a very holy place as it is believed that Gautama Buddha visited the site on his third trip to Sri Lanka. It also plays a prominent role in The Ramayana as the site where the virtuous demon Vibhishana was crowned king of Lanka. 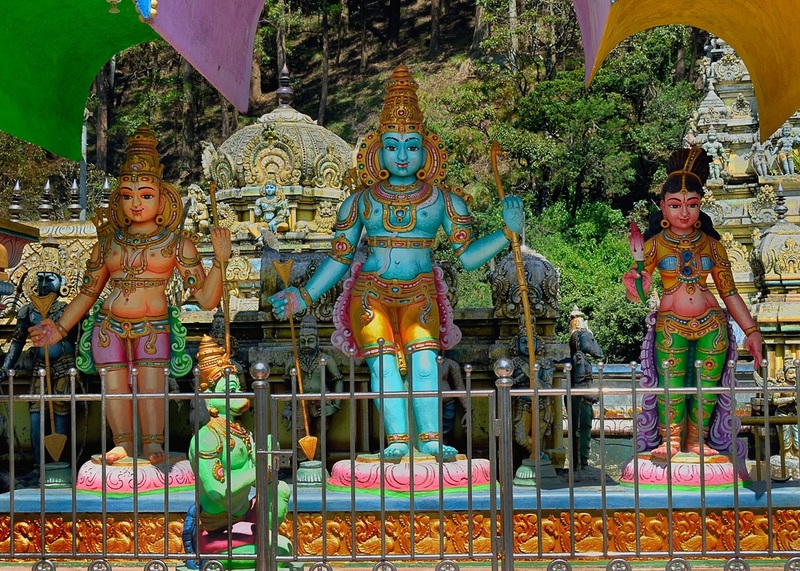 The temple is also famous for its beautiful artwork including hand-painted murals and sculptures by the highly regarded artist Solias Mendis. It took the gifted painter 10 years to complete work at this fantastic site. ​Other interesting temples in Colombo include the Gangaramaya Vihara and Seema Malaka Vihara on Beira Lake. Sri Lanka’s second largest city, Kandy, lies on the main railway line approximately 62 miles (100 km) from Colombo. Travel time by train, barring any delays, is two hours. This is an extremely busy section of the heavily traveled route from Colombo to Badulla. It is highly recommended to purchase either observation car or first class tickets in advance. Located among the hills of the Kandy plateau the city was the capital of the Kingdom of Kandy, the last part of the island to be ruled as an independent Kingdom. From 1593 until 1815 numerous attempts were made by the Portuguese, Dutch and finally the British to conquer the kingdom and colonize the entire island. Due to Kandy’s remote location in a heavily forested area and their skill in guerilla warfare their armies were able to repulse the European invaders for many years. Finally in 1815 the Kingdom of Kandy signed a treaty with the British in which Kandy would swear allegiance to King George III. The British exiled the last Sinhalese King of Sri Lanka, Sri Vikrama Rajasinha, to India, a common fate for leaders who resisted British Colonization. 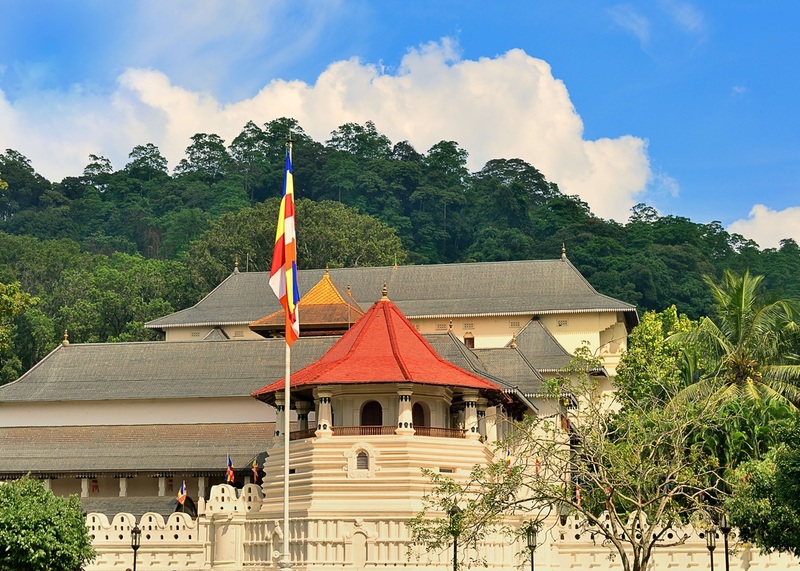 Kandy is best known for its Sacred City, a UNESCO world heritage site, and location of the Sri Dalada Maligawa or Temple of the Tooth. Legend has it that after Gautama Buddha (the historic Buddha) died he was cremated and the remains divided among his disciples. Among these “relics” was a canine tooth that eventually made its way from India to Sri Lanka. In Sri Lanka the tooth was placed under the custodianship of the Sinhalese monarchy who built a temple to house it on the grounds of the royal palace. 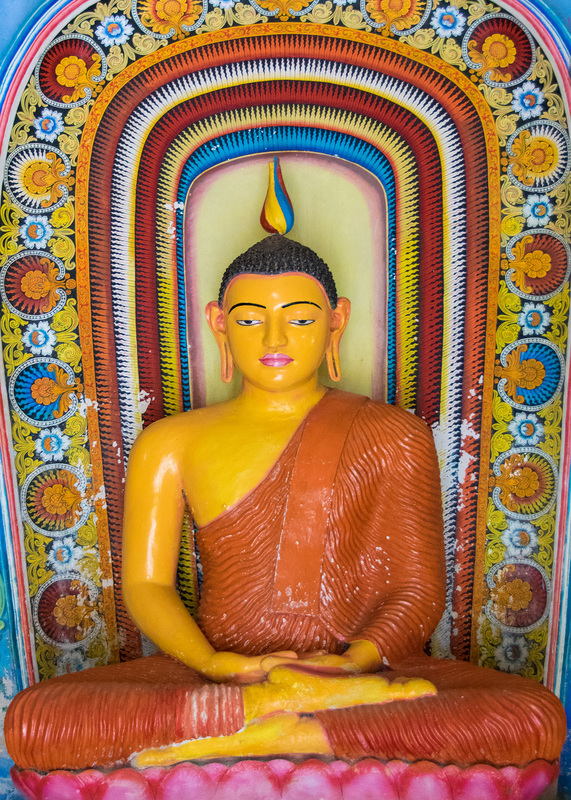 Today the Sacred City is an important Buddhist Pilgrimage site for Sri Lankans but is also visited by followers and travelers from around the globe. In addition to the main temple, there are several museums of interest on the grounds one of which is the World Buddhist Museum. This is a fantastic museum which displays exhibits on the history of Buddhist philosophy, art and culture in individual countries throughout the world. In 1867 a Scotsman named James Taylor created Ceylon’s first tea plantation in Kandy. Taylor’s timing could not have been better. In the1870s a blight destroyed the island’s coffee industry, which had been its biggest export crop. He would go on to build the first tea factory on the plantation, known as Loolecondera estate. Taylor developed many of the techniques and machines used in the processing of tea. 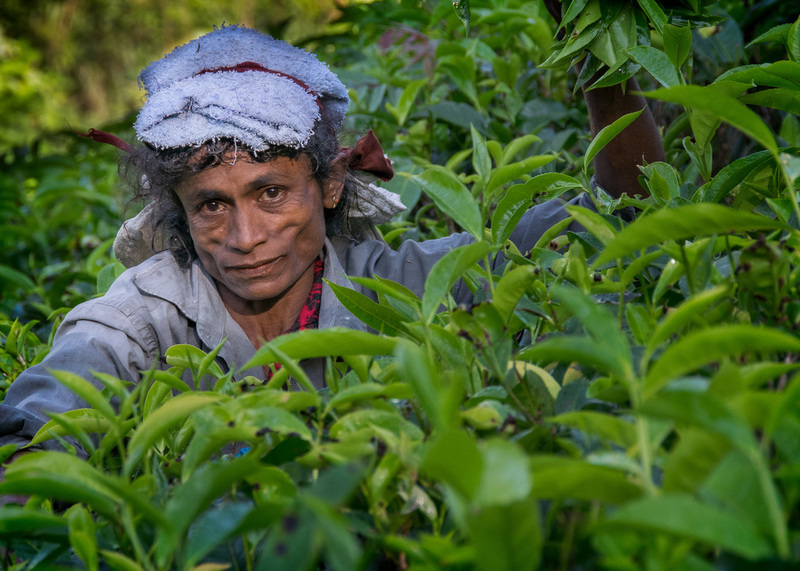 Today James Taylor is recognized as a key founder of the Sri Lankan tea industry. Adam’s Peak is a 7358 foot mountain (2243m) located in the central highlands 96 miles (155 km) from Colombo. Known by Sri Lankans as Sri Pada, it is considered to be an important pilgrimage site for Buddhists, Hindus, Muslims and Christians. Some Christians believe that biblical Adam first stepped to Earth on Sri Pada’s peak. The assent to the peak is not a technical climb. Over 5000 steps lead to the top, which can be completed by most people in three and a half hours or less. The goal is to get to the top to watch the sunrise so most people start their ascent by 02:00 AM. The climbing season runs from December through May. The closest town to the mountain is Dalhousie which has guest houses that cater specifically to climbers. Dalhousie can be reached by tuk tuk or bus from Hatton railway station. Traveling by train from Kandy to Nanu-Oya railway station is a great way to enjoy the spectacular scenery of Sri Lanka’s tea country. As the Main Railway Line continues eastward toward Badulla, travelers will stop and spend a few days in the small town of Nuwara Eliya. Tuk tuks and taxis are lined up outside Nanu-Oya station and will make the five miles (8km) to the town center in approximately 15 minutes. Most of the budget guest houses are clustered together in a small area just above the base of Pidurutalagala Mountain. The location overlooks Nuwara Eliya town and offers a nice view of the surrounding area. A series of narrow foot paths make up a shortcut to the town center, an enjoyable walk where you will meet friendly local people. ​With an elevation of just over 6,100 feet (1,868 m) the weather is notably cooler and less humid than costal Sri Lanka. Guest houses generally provide extra blankets and forgo air conditioners. The early morning hours can be quite chilly, requiring the use of a sweater or light jacket. The town itself is small and can be walked around quite easily. There are a number of colonial era buildings, a golf course and a horse racing track, all of which are left over from Sri Lanka’s colonial past. Mostly people stop in Nuwara Eliya to visit the surrounding hill country and sites outside of town. Here the countryside is simply spectacular with tea covered hills, mountains, deep valleys and an amazing number of water falls. Pidurutalagala Mountain is Sri Lanka’s tallest but is controlled by the military and can only be accessed by vehicles which stay on the main road to its peak. Other sites typically visited include the Pedro Tea Factory and Haggala Botanical Gardens. The area also has several important Hindu temples which are tied to the Ramayana Epic. The Seetha Amman Temple is located three miles (5km) south of the town on highway A5 on the way to the Haggala Botanical Gardens. In the Ramayana, Princess Seetha (Sita), the story’s heroine, is abducted by the demon (devil) Ravana and carried to the island of (Sri) Lanka. According to local tradition, the temple was built on the site where Seetha was held captive. Shri Bhakta Hanuman Temple is dedicated to the Hindu deity Hanuman who plays an important role in the Ramayana. 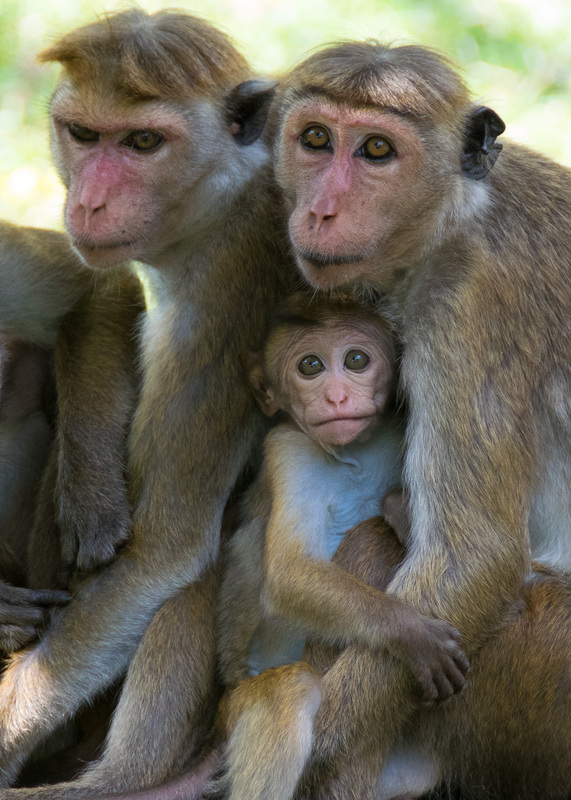 In the story, Hanuman, who worships the poem’s hero Rama, flies to (Sri) Lanka to find Princess Seetha. The temple is located at the Chinmaya Mission nine miles (15 km) from Nuwara Eliya. The Mission’s peaceful hilltop setting offers a magnificent view of the country side. Also on the grounds is a restaurant which serves delicious traditional vegetarian dishes and a variety of teas. The entire area around the temple is beautiful and a visit can easily be combined with stops at tea factories, scenic overlooks and waterfalls. The Horton Plains National Park is a very popular travelers’ destination primarily for two particularly scenic locations within the parks boundaries. The most breathtaking view, perhaps the entire point of visiting the park, is from a spot known as the World’s End. World’s End is precipice (cliff) which drops over 2,854 feet (870 m), the view from the site truly is spectacular. Looking over and across the valley visitors will be able to see Sri Lanka’s second and third highest peaks, Kirigalpota and Totapolakanda. 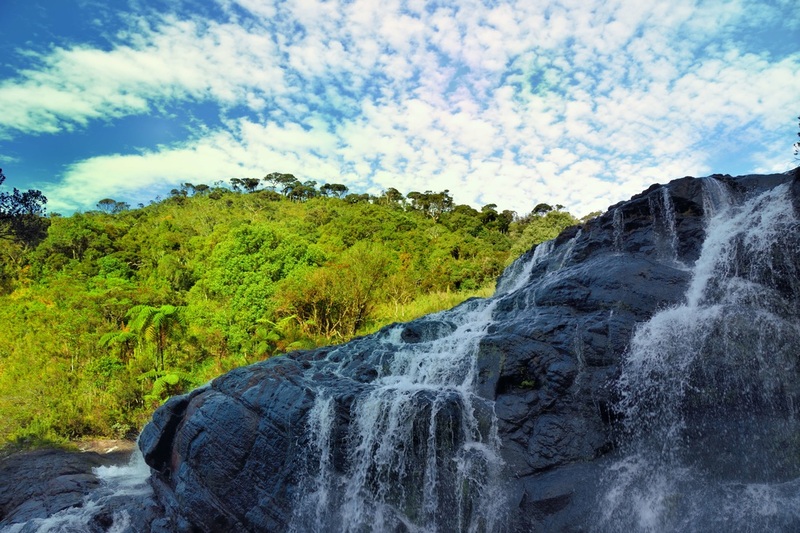 The second biggest attraction is Baker’s Falls, a beautiful 66 foot (20m) cascade waterfall. A well-worn circular path five and a half miles (9 km) long rings around and through the plain. To complete the entire trek takes roughly two and a half to three hours and is not difficult, particularly in the dry season which occurs from January through March. During the rainiest times of the year the path will be wet and muddy, requiring a proper pair of hiking boots and a light water proof jacket. It is recommended to start the trek early in the day (the park opens at 06:00 AM) in order to reach World’s End before late morning clouds form and obscure the view. The closest town to the park is Ohiya, which is conveniently located on the Main Railway Line. There is at least one guest house located near the railway station and a handful of others in the surrounding area. From Ohiya it is very easy and economical to arrange transportation to the park. Despite its distance from the park, many people will visit from Nuwara Eliya as it offers a better choice of accommodations, restaurants and stores. This is particularly true for travelers utilizing private cars and drivers. Otherwise it is very easy to find either a tuk tuk or taxi to make the trip. Transportation costs will vary and are usually negotiable so it pays to shop around before committing to a particular taxi driver. On our recent visit to Nuwara Eliya we enlisted the service of a one particular tuk tuk driver to take us to all the sites mentioned in this section, including Horton Plain. We paid a very reasonable price for the one and a half hour trip to the Plain. He also walked with us and acted as a tour guide at no additional charge. Although a tour guide is not necessary, it was nice walking with a local who could name various plants and trees and show us the highlights of the trail. Had he not suggested we walk the circular trail in a counterclockwise direction, we would never have known that this is the easiest way to complete the trek. Feel free to e-mail us for our drivers contact information. Situated among rolling hills and tea plantations, the small town of Ella has become a hub on the backpacking route through the hill country. Easily reached by railway, the once sleepy town is developing into a popular destination for ecotourism. There are many budget guest houses near the town center with several more under construction on the hill overlooking town. The town has a number of good restaurants that cater to travelers and include western dishes on their menus. Travelers come to Ella specifically to trek through tea country and usually include a visit to Little Adam’s Peak. Little Adam’s Peak should not be confused with its namesake Adam’s Peak, a 7000 foot (2243 m) mountain located 38 miles (63 km) to the east. Little Adam’s Peak is a pyramid shaped rock which towers 3743 feet (1141 m) above lush tea covered hills. It is not a particularly difficult walk but by midday it can be quite warm so please remember to carry plenty of water. Better still, start the trek early before there is any chance of clouds forming and obscuring the excellent view. Some other popular sites to see around Ella include the Newburgh Tea Factory, which can be included in a trek to the Demodara Bridge which is an impressive railway bridge surrounded by thick foliage and farmland. On the hill overlooking the bridge is a tiny tea shop where you can sip tea, relax and wait for trains to cross the bridge. Walking along the tracks and over the bridge is a popular stretch of the trek.